Lee & Low Books, 9781620147924, 32pp. Grandma's hijab clasps under her chin. Auntie pins hers up with a whimsical brooch. Jenna puts a sun hat over hers when she hikes. Iman wears a sports hijab for tae kwon do. As a young girl observes the women in her life and how each covers her hair a different way, she dreams of the possibilities in her own future and how she might express her personality through her hijab. 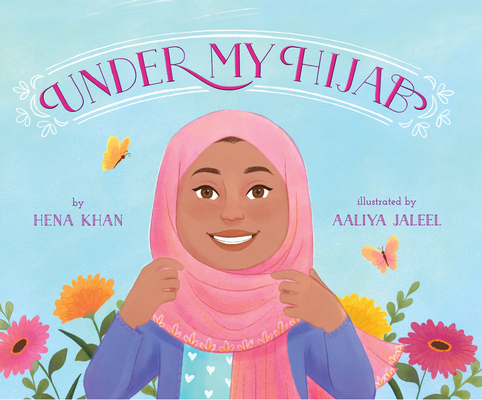 With cheerful rhyming text by acclaimed author Hena Khan, and charming illustrations from talented newcomer Aaliya Jaleel, Under My Hijab provides a friendly introduction to hijabs for all readers, and celebrates the many Muslim women and girls who choose to wear them.